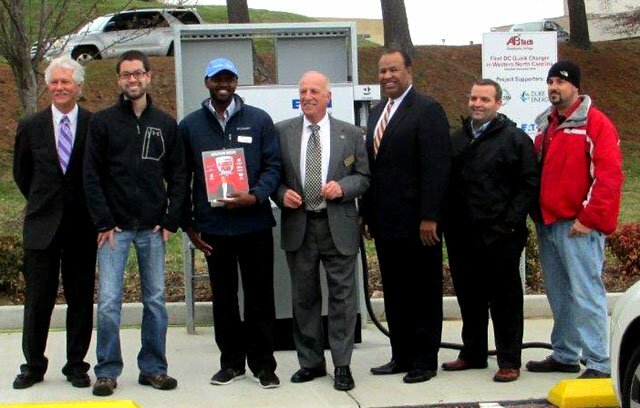 A-B Tech Community College opened an electric vehicle charging station, featuring one of Western North Carolina’s first public access DC Quick Chargers, which was awarded through a grant from Nissan USA Corporation valued at $27,000. The Quick Charger can charge a vehicle to 80% in 30 minutes or less. The college also purchased two Level II chargers that can charge within four to eight hours. The Quick Charger and Level II chargers were made locally by the Eaton Corporation facility in Arden. The station is located in the parking lot nearest to the Meadow Road entrance to A-B Tech and will be available for public use. The college will only charge cost recovery for the units and will run it as a not-for-profit system. "A-B Tech works with business, economic developers, non-profits, and government officials to contribute to the sustainability of Western North Carolina by striving for fiscal stewardship, environmental consciousness and social responsibility. These electric vehicle charging units are an example of this important work in action," said A-B Tech President Dennis King. 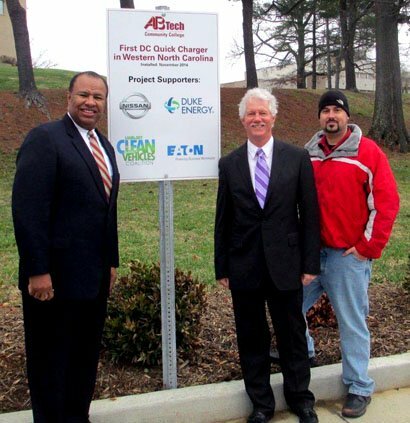 "We are grateful to have had so many dedicated partners helping to make this project a reality, including Nissan USA, Eaton Corporation, Duke Energy, and the Clean Vehicles Coalition," said King. Bill Eaker, Coordinator of the Land of Sky Clean Vehicles Coalition in Asheville, said the Coalition and its Electric Vehicles Committee have been working for about four years to get the Asheville Metropolitan Area ready for the roll out of the plug in electric vehicles (PEVs). PEVs include all-electric vehicles like the Nissan LEAF and Ford Focus and the plug-in gas-electric hybrids such as the Chevy Volt and Ford Fusion. The Coalition developed an Asheville Area Electric Vehicles Plan in 2013 and participated in the development of a Statewide PEV Roadmap. "The main goals of these plans include increasing public awareness of the benefits of electric drive vehicles and the development of a network of public access charging stations to help make drivers comfortable with purchasing these vehicles. As of mid-2014 there were more than 200 PEVs in the region and over 3,400 registered in NC and the numbers are growing at a fast rate," Eaker said. Eaker said most charging is done at home overnight, but that over the past four years local partners have installed more than 80 public and workplace charging stations at over 36 locations in the metro area. "Most charging stations are in Buncombe County so the Coalition is working to expand the network into other nearby counties. We’re making great progress," he said. Daniel Stokoe, Clinical Coordinator/Surgical Technology Instructor, at A-B Tech owns a Nissan LEAF, an all-electric vehicle he purchased two years ago. "I made a good choice for me, environmentally and monetarily, since I do so much traveling for the college." Acting as a private citizen, he researched charging stations and about a year later was put in touch with Nissan North America, who was offering the chargers through a program that was slated to end. Stokoe worked with A-B Tech leadership to help secure the grant. One of 58 colleges in the North Carolina Community College System, A-B Tech offers associate degrees, diplomas and certificates in more 50 curriculum programs through its five academic divisions: Allied Health and Public Service Education, Arts and Sciences, Business and Hospitality Education, Emergency Services and Engineering and Applied Technology. The Division of Economic and Workforce Development/Continuing Education offers opportunities for workforce partnerships, specific job training and retraining, as well as personal enrichment classes. A-B Tech enrolls more than 25,000 curriculum and continuing education students in programs at its Asheville, Enka, Madison, South, Woodfin and Goodwill locations.